When you first flip this brown fedora hat for men over, you'll immediately notice the luxurious white satin lining that has been sewn in. 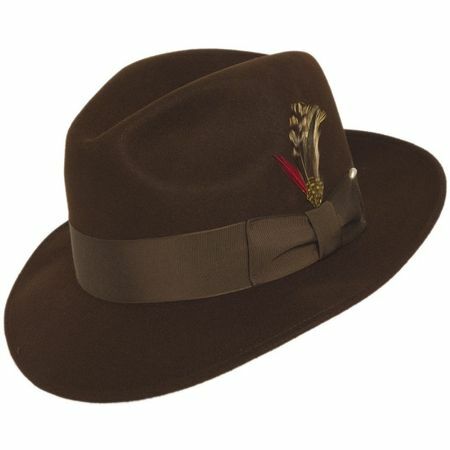 This tells you that this is a real brown fedora hat for men and not some cheap hat that you see in a mass retailer. A brown fedora hat also know as an untouchable dress hat is a wonderful way to make your look in public complete when you are wearing an overcoat. Let's face it, when you see a man wearing an overcoat and a brown fedora hat for men on his head, he looks like a well dressed man who knows that his image counts. You can wear a brown fedora hat with either a brown or camel color coat and look simply great while wearing it. Read More about Fedora Hats.